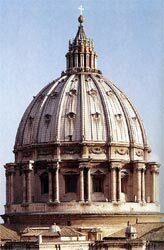 Saint Peter's Cathedral (or Basilica) was inaugurated in a.d. 396, by pope Sylvester. Found in the Vatican City, which has been the residence of Pope's since 1377, it had been built by Constantine on Saint Peter's grave and the altar lies exactly on Saint Peter's tomb, where his relics are. The Cathedral we see today was started in 1506 and completed 120 years later. Many famous Renaissance architects contributed to its construction, Bramante among them. In 1546 pope Paul III appointed Michelangelo Buonarroti, already in his sixties, as official architect in charge. Michelangelo designed the greek cross plan which was then completed by Della Porta, who designed the dome, and by Carlo Maderno, who built the facade. Saint Peter's Cathedral was consecrated on Nov. 18, 1626. From Saint Peter's portico you enter the main entrance hall, with its five doors. On the right you can see the Holy Door, which is opened only every 25 years, in Jubilee or Holy years. Saint Peter's Cathedral has very remarkable dimensions: it is 230 m. long, the vault is 38 meters high, and the wings of the Dove of the Holy Spirit above Bernini's Baldacchino are 1,4 m wide.In the first chapel on the right there is the cathedral's most beautiful sculpture: the Pietà by Michelangelo. This is Michelangelo's masterpiece, finished when he was only 23 years old, perfect in the figure's proportions as well as in their expression. On the band across the Virgin's breast, Michelangelo carved his name. This is one of the few sculptures he finished and the only one he signed.